It makes complete sense to me why the Puzzle Piece has been chosen as the International Symbol of Autism. People who fall into the Autistic Spectrum tend to feel isolated from “NORMAL SOCIETY” and therefore may feel like they don’t “fit in”. The piece could represent the fact that in order for the beautiful picture to be revealed, well it takes a lot of effort and a lot of different pieces to make it happen:parents, family, friends, doctors, teachers and so on. Maybe it was chosen as the icon because many children who have autism play with puzzles as they are a “by yourself” type of activity in which you are not required to interact with others. Or as my son so eloquently put it, “Well duh mom…it’s because Autism is so puzzling! None one knows why you get it.” God I love that boy! But to me the puzzle piece has a different meaning. Instead of thinking of the word Puzzle as a noun like above where it refers to a game or a condition, I see the word as a verb. To clarify or solve (something confusing) by reasoning or study: He puzzled out the significance of the statement. I see it this way since I quit my job a month a go. I puzzled out the significance of the decision to do so. But when the last piece was finally handed to me, or should I say it was more like thrown at me, well I accepted it and fit it in. We moved here in June and I was not planning on going back to work right away. I wanted to take time to get my kids, especially Jay, acclimated and settled in. This was their first time attending schools in America as the past four years we had lived abroad. It was a huge change for all of us. My husband was thrown into work so settling into our home and everything else was put on me. Things were starting to come together and the kids seemed happy, which was a huge relief to me. The major problem was finances. After living abroad where the government paid for our housing and utilities, we were now thrown back into the real world and we were doing it on one pay check. So when I happened to come across the job announcement that seemed like the perfect fit for me, I jumped at it, even if the timing of it all did not seem right. You know that old saying about how you really should look first before jumping, or the other one that says something like if it seems to good it probably is? Well I should have listened. I was hired as the Community Relations Specialist for a FOR-Profit post secondary school. I was told my job was to create and maintain effective relationships with local high schools administration and community organizations. I was in charge of Reputation Development for the school. This seemed like an ideal job for me and the salary was very very generous (CHA-CHING!!!) There was no training, and whomever had my position before had left no records (should have been my first clue). So basically I was on my own to figure out how to do this. Those that know me will tell you this is the type of challenge I love best. Give me a task and then give me the space to get it done. My space I soon realized spread across all of Northern Virgina, parts of Maryland and even parts of West Virgina. Some of the so called LOCAL schools I was suppose to develop relations with were more than 3 hours away. (Clue number two.) A few weeks after I got the job, my supervisor, who had only been with the school for 4 months, quite. (Hmmm… Clue number three) The Educational Representatives were not upset by this, in fact his leaving was a relief. I took this as an opportunity to get to know my fellow employees better and to learn about the school and the company itself. After all, how could I go into the High Schools and tell them about our school if I could not answer questions they may have. I immediately started bonding with several co-workers, who would share with me their stories. It seemed no one working for the school was happy. I could not understand this. One day the Campus Director (The big boss) called me into her office and told me flat out that she did not want me to talk to the other employees. She told me that the sooner I got out into the field the better and that I should not talk to the others as they were just bitter and unhappy. (Definitely clue number FOUR) In fact she even named certain people and said things that frankly a boss should not be saying. I left her office feeling baffled but I dismissed the conversation and chalked it up to her having a bad day. Fast forward three months. For someone who was never trained, I was doing really well. I was developing great relationships with the Guidance staff at the schools and had even gotten two different counties to consider Articulation Agreements with our school. This was huge as no one else in my position had ever been able to do this. Even though I did not totally believe in my school, I still felt that it was a viable option for many people so I continued to do what I was doing. But then Clue Number Five happened. It was during an Open House event that I had planned for the school for High School Students to come and check it out to see if this was the place for them to go after they graduated. The representatives were so impressed as we had the biggest turn out ever. As we showed the folks around the school, The Big Boss pulled me aside. She started telling me that the event was not a success because most of the people attending were not seniors. I tried to tell her that if they were interested enough to come to the school on a Saturday, that even though they were Juniors this was a huge success as they would come back when they were ready to graduate. She then spent five minutes lecturing me on how that does not matter. What matters is filling seats and Juniors could not fill seats. I had to walk away from her. I knew then that I wanted to quite but thought I would just start looking and then quit when I found another job. Two days after the Open House, the Boss called me back in. She wanted to discuss my progress. She then started telling me that although all the reputation development stuff I had been doing was great, it was not producing numbers. “We are a For-profit school and lets face it, all the stock holders care about is that people are in the seats.” (Clue Number 6 if you are still counting.) Then she said (okay are you sitting down because you really need to be sitting down for this one!) ” And I know you have a child with Aspergers, but we really don’t want THOSE type of disabled people coming here!” ( SLAM DUNK IN MY FACE YOU CANNOT DISREGARD THIS ANYMORE CLUE NUMBER 7) It took all my will to not jump across the desk and smack her. 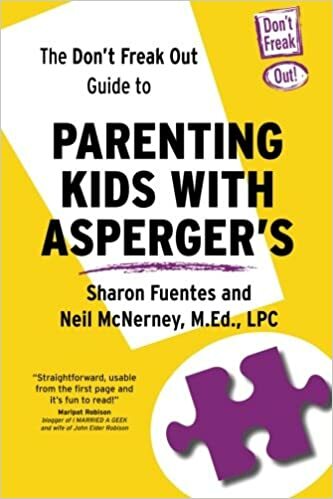 Through tears of anger I said, “I don’t know what THOSE people you are referring too, but I can tell you that just because you have Aspergers does not mean you are disabled. My son may think differently and have some challenges but he is definitely not disabled!” At this point realizing that she had said something incredibly un PC, she started to scramble and back talk.I left her office grabbed my purse off my desk and left. That night as I was putting Jay to bed, he handed me the last Clue the last Puzzle piece. He said to me, “Mommy, I heard you talking to daddy. I am not disabled mommy. Don’t worry mommy I didn’t want to go to that school anyway, I am going to go to Harvard and that will show her and all the others out there too!” It clicked. Not only did I know that I needed to quit that stupid job, I knew that what I needed to do was something to show all those people out there how wonderful my son is and all the other JAYS out there are too. My son, who so many people see as a puzzle (in the noun form) had just helped me puzzle out (in the verb form) what I needed to do. So now you know why all the sudden I have become so vocal. Why all the sudden I am determined to make more people aware. On April 2nd I will wear Blue and I will light my house up and I will continue to talk and make people aware. I will go next week into my kid’s school and pitch ideas of what we can do as a school to raise money and once again MAKE PEOPLE AWARE. And maybe some day everyone, including the Big Bosses out there will be able to see what I have been able to see along, what an incredible person my son is! I’m just speechless! Honestly, my mouth just fell to my chin and stayed there until I finished reading this. The board of directors of that school needs to know what is running it for them. That is the sad thing… they do!!! Oh my God! Okay, at some point (offline) I want to know which school this was. I’m disgusted. Every day is another reminder of what we’re fighting for. The very sad thing is that I did file a complaint against her with the board and nothing was done. She was smart enough to make that comment when only I was in her office so basically it was her word against mine. She told them I was upset because she was telling me how I was not not producing numbers the way I was suppose to and that I heard wrong what she said. She even sent me an email after wards telling me how sad she was to see me go and how she enjoyed our conversation on special needs children. I wanted to throw up when I read it. It is a huge shame because the school would be so much better if she was not in charge. 4 other people have quit since I left and 3 of them have filed claims against her and still she is there. But now that more time has passed I actually am happy it all happened. I think up until that moment I really had not come to terms with Jay and his autism. When she said what she said and then Jay said what he did… it snapped me back into reality. It was time to stop thinking that things would just get better some day on there own. If I want change, if I want my son to be treated the way he deserves to be treated and the way that the entire autism community deserves to be treated… well then I better start doing something about it. So that is what I am trying to do. Small baby steps but I figure it is a start! Thanks for reading everyone!